Two things in this world which continually evolve, even from month to month, are cars and technology. A vehicle which came on the market a year ago will have diminished notably in value to today, while the iPhone SE is viewed in some quarters as a retro version now that the iPhone 7 is for sale. Motoring technology is equally fast-paced; manufacturers never rest on their laurels once their latest innovation is released. 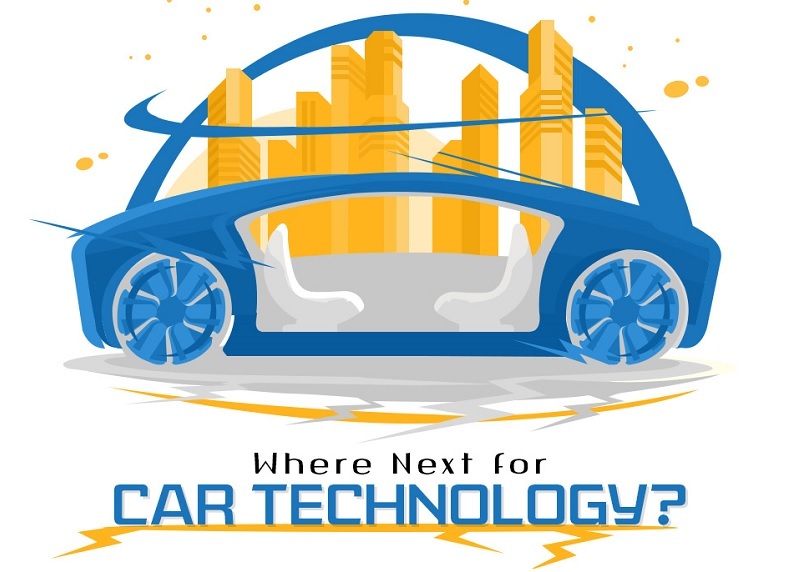 Today we are sharing an informative Infographic based on Top Ten (10) Upcoming Smart Car Technologies and Future of Automobile Industry in coming years. You’ve probably seen a cartoon or sci-fi film at some point where, in the future or in a parallel universe, one of the main protagonists is travelling via a robotic car which does the driving for them. We haven’t reached that stage just yet, but considering the autonomy that some vehicles now possess, it may not be all that far away. Tesla is developing an autopilot system which includes automatic steering, lane change and parallel parking. While not 100% driverless, it is probably the closest we have come to the dawn of ‘robot cars’. Mercedes-Benz has showcased rotating seats at various auto shows, whereby motorists can swivel 180 degrees for face-to-face conversation with others in the vehicle while the car does the work. These innovations may be a bit away from launch just yet, but other, simpler new technologies seem to be on the verge of becoming a tangible reality, particularly those which involve screens. Between smartphones, tablet and other touchscreen devices, tapping a pane of glass or viewing information on one is now an everyday activity for most of us. Key fobs will soon have an LED display showing information about your vehicle; holographic windshield will display an array of information like driving speed and directions, while even the time-honored owner’s manual will inevitably become an app instead of a physical booklet. This Infographic from Southside Motor Factors highlights 10 of the most fascinating technological innovations that are anticipated for inclusion in vehicles before long. If these seem scarcely believable now, just remember that it has only been a generation or so since electric windows and sunroofs were perceived as groundbreaking new features. In time, we will more than likely become accustomed with starting a car with our thumbprint, glancing at the windscreen to see our driving speed lit up in green, digitalized font and turning around to other people in the car for a prolonged chat while the vehicle navigates its own way along busy highways. Let’s check out the infographic for more.